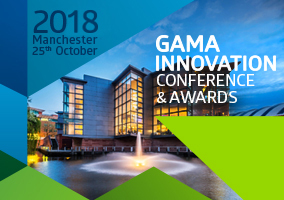 MANCHESTER – 8th March 2018: Gama, a global provider of business information and services specializing in product innovation and international trade, is today pleased to announce the return of the Gama Innovation Conference & Awards (GICA) in October 2018. Staged at Manchester’s iconic Bridgewater Hall, GICA is returning for its 3rd edition on Thursday 25th October 2018 for what promises to be another inspiring and engaging day on the theme of fast moving consumer goods (FMCG) innovation. The invitation-only event will begin with the Gama Innovation Conference, bringing together the great and the good from the world of consumer goods for a unique morning of presentations and discussions. The conference will be followed by the Gama Innovation Awards, a celebration of outstanding product innovation from around the world as voted by the leading names in the industry. Meanwhile, delegates will also have the opportunity to network and get inspired within an expanded Innovation Zone, where up to 40 disruptive companies will be showcasing game-changing launches from all over the world. Cesar Pereira, founder & CEO at Gama, commented: “We are thrilled to host the third Gama Innovation Conference & Awards right here in the Northern Powerhouse, once again putting Manchester in the fast moving consumer goods (FMCG) spotlight. We will be welcoming more than 100 manufacturers, exhibitors, buyers and other selected guests from over 25 countries for a unique showcase of global FMCG innovation. This will be a one-of-a-kind event offering thought-provoking presentations and inspiring ideas, as well as fantastic networking opportunities in a dynamic yet informal setting”.